A security official and two assistants have been suspended for allowing the entry of a look-alike of Union Cabinet Minister Shatrughan Sinha inside the Parliament complex without any valid document yesterday. The Delhi High Court has declined to entertain a petition for a Central Vigilance Commission inquiry against the vice-president of the Chandigarh Income Tax Appellate Tribunal for alleged malpractices on the grounds of jurisdiction. Deputy Prime Minister L.K. Advani and BJP President M. Venkaiah Naidu today discussed about holding simultaneous Lok Sabha and Assembly polls either this year or next year at the party headquarters. An artist gives finishing touches to an idol of Lord Ganesha at a workshop in Mumbai on Saturday. 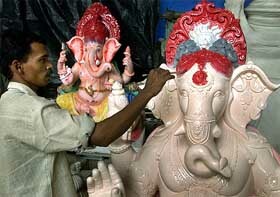 The idols are being prepared for the Ganesh Chaturthi festival, to be held at August-end. Bollywood actress Rekha at the unveiling function of the special issue of 'ELLE' magazine, in Mumbai on Saturday. 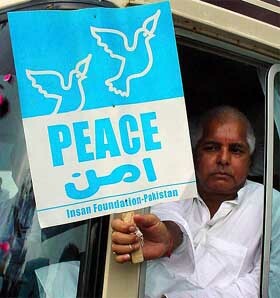 Laloo Prasad Yadav holds a placard after crossing into Pakistan at the Wagah border near Lahore on Saturday. The Union Law Minister, Mr Arun Jaitley, today said that the recommendations of the Mallimath committee and the Law Commission of India on improving the criminal justice system were in an advance stage of consideration. Qutubuddin Ansari, the traumatic face of the Gujarat riots, and his family found a new home here today hoping to finally settle peacefully after being hounded out of home town Ahmedabad. At least 200 Social Justice activists, including expelled BJP MLA Devi Singh Bhati, were arrested early today as a preventive measure on the eve of Prime Minister Atal Bihari Vajpayee’s visit here, a senior police official said. The authorities of all international airports have been alerted to prevent RJD MP Mohammed Shahabuddin, wanted in cases of alleged murder and kidnapping, from leaving the country, the Bihar police chief said today. The indomitable and unique style of Rashtriya Janata Dal supremo Laloo Prasad Yadav was on display today when he boarded the Amritsar Shatabdi carrying parliamentarians and journalists on a goodwill mission to Pakistan to give a fillip to the ongoing peace process. Encouraging students to seek ways to face global competition and put India among the top 10 developed nations, Vice-President Bhairon Singh Shekhawat lauded the graduating students of the Indian Institute of Technology as “the best bet”. Terming his agitation against corruption as the “second battle for independence”, noted social worker Anna Hazare today demanded a CBI probe against four DF ministers and into the irregularity charge levelled against him. The Congress yesterday reacted cautiously to the Supreme Court order on strike by government employees, saying that it was still studying the judgment, but people should have avenues for expressing their problems. Sushma Swaraj says the government has sent samples of Pepsi and Coke to laboratories to test if they contain any toxic pesticides. Kolkata-based Pradeep Chaterjee masters the art of playing nasal flute and dreams of making it to the Guinness Book of World Records. A security official and two assistants have been suspended for allowing the entry of a look-alike of Union Cabinet Minister Shatrughan Sinha inside the Parliament complex without any valid document yesterday, Deputy Speaker P.M. Sayeed said today. Mr Sayeed, Chairman of the Parliament Security Committee, held a high-level meeting of Parliament security and Delhi Police officials to review the security situation arising from yesterday’s incident and decided to take action against the three. Balbir Singh Rajput. the look-alike of the Minister, had yesterday entered the Parliament complex without any valid document taking advantage of his looks which matched that of the filmstar-turned politician. He had just walked inside the complex talking constantly on his mobile and after spending about 20 minutes there he had moved out of Parliament from the other gate. Later he also visited the office of the Shipping Minister in Transport Bhavan at Parliament Street. The Deputy Speaker said an inquiry had been ordered and would be conducted by senior security officials of Parliament to establish under what circumstances Balbir Singh made his entry into Parliament and came out without detection. 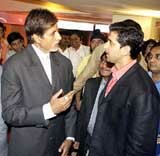 However, Mr Sayeed questioned the rationale behind the “operation’’ carried out by “Aaj Tak’’, a private TV channel. Hinting about the possible action against Balbir Singh, he said a case of trespass and impersonation was made out. But did not say if a case would be registered against the look-alike. Meanwhile, Balbir Singh was picked up by the Delhi Police and taken to the Parliament Street police station for “questioning’’. His interrogation which started around noon continued till late in the evening. 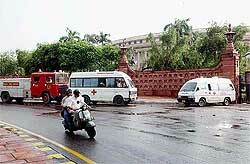 Fire tenders and ambulances being parked outside the Parliament House after a bomb-hoax call was received on Saturday. Security personnel today went into a tizzy in the Parliament House complex after the police received a hoax bomb call. However, after a complete search by the bomb disposal squad, fire tenders, dog squad and security personnel of the complex the call was declared as hoax. The Delhi High Court has declined to entertain a petition for a Central Vigilance Commission (CVC) inquiry against the vice-president of the Chandigarh Income Tax Appellate Tribunal (ITAT) for alleged malpractices on the grounds of jurisdiction. A Bench headed by Chief Justice B C Patel declined to issue notice on a public interest litigation (PIL) filed by the All-India Lawyers’ Forum for Civil Liberty (AILFCL), stating that the Delhi High Court was not the appropriate forum for considering the plea. The court, however, told forum counsel O.P. Saxena that the forum was free to move the court of appropriate jurisdiction at Chandigarh. The AILFCL, in the PIL filed through its vice-president Manoram Nigam, had sought a CVC inquiry against the tribunal vice-president, alleging that various lawyers practising in taxation in Chandigarh, Delhi and Mumbai had written to the forum that he had been taking undue advantage of advocates. The PIL stated that theAILFCL had no malice towards anyone and was only concerned about enforcing the rule of law. Forum counsel alleged that in 1997, Mr T V Rajagopal Rao, the then president of the ITAT, had withdrawn the powers of the vice-president regarding constituting benches of the tribunal to hear cases. The forum alleged that rules and procedures were not being followed in deciding tax-related matters and many a times the cases were heard by him in the chamber. As per the office manual, the Bench for hearing cases listed for the week has to be constituted every Thursday but the ITAT vice-president at Chandigarh “always prepares and notifies the constitution of the Bench only on Friday between 5 and 5.30 p.m.” the forum alleged. Addressing a meeting of the party’s ‘defence cell’, Mr Advani said that whether the elections were held in 2004 or “this year”, Prime Minister Atal Bihari Vajpayee would again be elected by the people to lead the nation and complete the BJP’s vision of making India into a developed country by 2020. Immediately after the conclusion of the meeting, Mr Naidu told newspersons that the BJP was all for the “simultaneous” elections as it would save “resources, energy and time”. “Though we have not yet talked formally either within the party or with the allies”, Mr Naidu said and added that the party had been stressing on clubbing of the Lok Sabha elections with the Assembly ones for quite sometime now. Some informal consultations had taken place on the issue but no formal talk had been held either with the Election Commission or with the Opposition, he said, adding that the BJP was serious about the issue. Asked about the media reports concerning BJP MLA Yashodhara Raje, daughter of late Rajmata Vijayraje Scindia, quitting the party, Mr Naidu evaded the question saying that neither Delhi nor Bhopal knew about it. When asked about Mr Advani’s statement that a legislation for construction of a Ram temple in Ayodhya could not be brought in Parliament, Mr Naidu agreed saying that there was no consensus on the issue within the NDA. Earlier, Mr Advani told the gathering of senior retired defence officers that there was a need to create self confidence as there was too much of “negativism and cynicism” in the country. Recalling that no one had believed in 1998 that Mr Vajpayee-led NDA government would last a full term. But the country had seen seven Prime Ministers in 10 years from 1988. 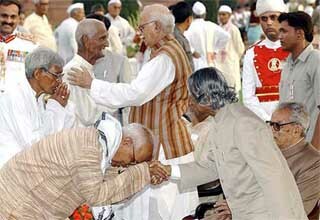 But only Mr Vajpayee had given political stability to the country for the last six year, Mr Advani said. “A number of recommendations made by these two advisory bodies are being considered at the highest level, including the law relating to the hostile witnesses,” Mr Jaitley said, while addressing a seminar on “modes of execution of death penalty,” organised by the commission. Mr Jaitley said that there was a “silver lining” in the concern expressed by the legislature, judiciary and executive on the issue of large number of acquittals in criminal cases due to the problem of hostile witnesses. The minister said within three months of the presentation of the Mallimath committee report on April 21 this year, the government had prepared a draft action plan on four issues - hostile witnesses, perjury, plea bargaining and compounding of minor offences. He said that he, along with the Law Commission, had given a presentation on June 28 before Deputy Prime Minister L K Advani in the Home Ministry on the manner in which the Criminal Procedure Code could be amended to effectively deal with the problem of hostile witnesses resulting in miscarriage of justice. He indicated that the matter was being considered by the Home Ministry, which was the administering ministry for the criminal laws. It would soon be placed before the Cabinet. Law Commission member N.M. Ghatate said an overwhelming number of respondents, to an online poll conducted by it, favoured using lethal injection or other ways of executing a convict — rather than hanging till death. Commission Chairman M J. Rao told delegates that the deterrent value of capital punishment was yet to be conclusively established. He noted that European nations had outlawed it and made its abolition a condition to joining the European Union. Ansari, who hit global headlines after photographs of his tear-soaked face and folded hands became synonymous with the plight of Gujarat riot victims last year, has been given asylum by the CPM and a few of its organisations. Amazed at the presence of hordes of cameramen, Ansari, with son, daughter and wife, had a tough time alighting from the Geetanjali Express at Howrah station before leaving for his new home in the Park Circus area of the city. The electronic media was disappointed as a tight-lipped Ansari was rushed to his new home without giving them a sound byte, though he later spoke to journalists briefly. “I have faced a lot of problems everywhere I went after the riots. Now in West Bengal, I wish I could lead a peaceful life,” Ansari said. At least 200 Social Justice Front (SJF) activists, including expelled BJP MLA Devi Singh Bhati, were arrested early today as a preventive measure on the eve of Prime Minister Atal Bihari Vajpayee’s visit here, a senior police official said. The SJF activists were on a fast-unto-death for the past four days in support of their demand for reservation for the poor among the forward classes. The arrests were made around 5 am, apprehending disturbance during Mr Vajpayee’s visit, Deputy Inspector General of police Ajit Singh said. They were taken to the Central Jail after producing before a Magistrate who ordered for their judicial custody, Mr Ajit Singh said. Mr Bhati was suspended from the BJP on Tuesday by party state chief Mr Vasundhara Raje after he threatened to disrupt Vajpayee’s proposed meeting here to put forward his demand. Besides Mr Bhati, former MP Mahendra Singh and Sarv Brahman Mahasabha president Suresh Mishra were among those arrested. Mr Vajpayee is scheduled to arrive here tomorrow afternoon and return to the national capital after addressing the meeting at around 5 pm. Mr Vajpayee will launch the BJP’s campaign for the Rajasthan Assembly elections by addressing a “parivartan rally” here tomorrow. Director-General of Police D.P. Ojha, who ordered the Siwan strongman’s arrest in three cases, said here that the alert was sounded a few days ago. He said Shahabuddin had links with gangs operating at the national level in Uttar Pradesh, Mumbai and other places and at the international level, which had to be probed by the CBI. He said the state police had unanimously taken the decision to recommend a CBI probe into the links. Two of his associates were arrested from the industrial town of Asansol in West Bengal’s Burdwan district last night. Yet another accomplice, Thakur Manoj Kumar Rana, surrendered before the Chief Judicial Magistrate’s court in Siwan yesterday. All eyes were curiously set on Mr Yadav’s baggage. Mediapersons who had gathered at the New Delhi Railway Station were eager to know what India’s most “popular’’ politician was carrying with him on his three-day visit to the neighbouring country. Besides the message of peace and brotherhood, Mr Yadav is taking with him Bihar’s humble pie sattu (baked gram flour), paan (flavoured betel leaf), guava, chilli pickle and green chillies. And for the special day when he will meet Pakistan President Pervez Musharraf, peacenik Laloo will be wearing a white kurta specially tailored for the occasion. The stock may not last through his visit, but Mr Yadav plans to ask for sattu and paan from his Pakistani hosts as he did during his visit to the USA. Mr Yadav is also eager to meet his “Bihari brethren” in Pakistan. “Mein un Bihari bhaiyon se zaroor milna chahta hoon jo ke bade pemane par Pakistan mei base hei,” said Mr Yadav attired in kurta pyjama and a Muslim headgear. Immediately after getting the permission from the Supreme Court, Mr Yadav rushed to Patna to make arrangements for his visit. The residence of Bihar’s ruling couple —1, Anne Marg — was abuzz with activity to ensure that all his favourite items were packed for the journey. The delegation, consisting of at least 20 MPs and 10 journalists, will also attend a seminar organised by the South Asian Free Media Association. Encouraging students to seek ways to face global competition and put India among the top 10 developed nations, Vice-President Bhairon Singh Shekhawat lauded the graduating students of the Indian Institute of Technology (IIT) as “the best bet”. Delivering the 34th convocation address here today, the Vice-President said, “You are among our most talented human resource. In the new world order of knowledge economy, you are our best bet to seize opportunities and leapfrog our country to the high growth trajectory”. Mr Shekhawat asked youngsters to seek ways to face global competition with a sense of urgency. He also expressed concern over the ever-increasing number of IIT graduates leaving the country for better prospects abroad and called for a national consensus to provide a “hassle-free and corruption-free” governance. Noting that talented manpower could be a major player in shaping India’s future, Mr Shekhawat said, “Given the right environment and infrastructure support, we know what our professionals, doctors and engineers can achieve”. At today’s convocation, 1,256 students were awarded PhD, MTech, MBA, DIIT, MSc and BTech degrees. Sixtyfour of the graduating students were awarded medals and cash prizes. “I will not withdraw my agitation till all demands are met by the government and am willing to sacrifice myself for creating public pressure on the government”, Mr Hazare vowed while addressing activists of his “Bhrashtachar Virodhi Jan Andolan” at the Azad Maidan here. Asking Mr Hazare to call off his fast, Maharashtra Chief Minister Sushil Kumar Shinde at a function at the August Kranti Maidan, said, The government has agreed on all demands made by the social worker. We are open to consider a demand for the appointment of a retired judge to probe charges levelled against the DF ministers by Hazare and of those hurled against the social worker”. Party spokesman Satyavrat Chaturvedi said Parliament had the right to debate court judgments. “Though normally it is not done, the judgment can be debated in exceptional cases,’’ he said.